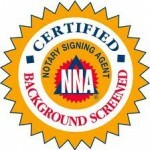 Certified Notary Signing Agent – Notary Public. Where to find a notary? A notary public (or notary or public notary) in the common law world is a public officer constituted by law to serve the public in non-contentious matters usually concerned with estates, deeds, powers-of-attorney, and foreign and international business. A notary’s main functions are to administer oaths and affirmations, take affidavits and statutory declarations, witness and authenticate the execution of certain classes of documents, take acknowledgments of deeds and other conveyances, protest notes and bills of exchange, provide notice of foreign drafts, prepare marine or ship’s protests in cases of damage, provide exemplifications and notarial copies, and perform certain other official acts depending on the jurisdiction. Any such act is known as a notarization. The term notary public only refers to common-law notaries and should not be confused with civil-law notaries. 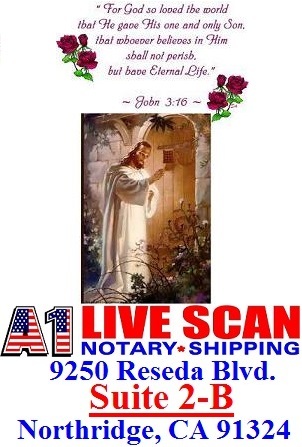 A1 Livescan Notary Shipping Notaries are Licensed, Certified Notaries in the state of California serving all of Los Angeles County and surrounding areas. We specialize in providing prompt and professional notary service you can trust! Our Certified Notaries provide superior customer service, specialized notarial knowledge and loan signing services On-Call and in-house! . A1 Livescan Notary Shipping Notaries will travel to meet your needs. We’re here for you 24/7! We charge the state approved fee of $10 per notarized signature for in-house services. Travel fees are assessed per distance and usually average $40 within San Fernando Valley. Call Today for a free quote! At A1 Livescan Notary Shipping we specialize in loan signings! Our highly-skilled Notary Publics are well versed in all legal documents. If you are closing on a home, we can work with the title company to bring the paperwork to sign at your home, office or other location! You benefit by closing on your home faster and with convenience. Our licensed notaries can also assist with wills, divorce, child custody agreements and other important documents. Allow our experienced notaries to assist with your entire document signing needs!. Our professional Notaries have over fifteen (15) years of experience notarizing simple to very complex documents. We accept e-documents & offer Mobile Notary Public Services. Public Notaries are entrusted with the task of properly identifying the individual signing a document in accordance with the State of California’s notarial laws.Public Notaries are also required to certify under penalty of perjury that the signer of the document personally appeared in front of the notary, acknowledged signing the document and is in fact the right person mentioned in the signature block of the document. Public Notaries Services in California perform a broad array of notarizations ranging from a simple travel document to complex loan and legal documents. Notary Publics are licensed and regulated by the Secretary of the State and are restricted in what they can and cannot do as a public servant. A Notary Public is a public servant appointed by state government to witness the signing of important documents and administer oaths. A Notary Public is an official of integrity appointed by state government typically by the secretary of state to serve the public as an impartial witness in performing a variety of official fraud deterrent acts related to the signing of important documents. These official acts are called notarizations or notarial acts. Notaries are publicly commissioned as ministerial officials, meaning that they are expected to follow written rules without the exercise of significant personal discretion, as would be the case with a judicial official. It is the foremost duty of a Notary to screen the signers of particularly sensitive instruments such as property deeds, wills and powers of attorney for their true identity, their willingness to sign without duress or intimidation, and their awareness of the general import of the document. Some notarizations also require the Notary to put the signer under an oath declaring under penalty of perjury that the information contained in a document is true and correct. Impartiality is the byword of the Notary office and the foundation of its public trust. Notaries are duty-bound not to act in situations where they have a personal interest. The public trusts that the Notary’s critical screening tasks have not been corrupted by self-interest. And impartiality dictates that a Notary never refuse to serve a person due to race, nationality, religion, politics, sexual orientation or status as a non-customer. As official representatives of the state, Notaries Public certify the proper execution of many of the life-changing documents of private citizens whether those diverse transactions convey real estate, grant powers of attorney, establish a prenuptial agreement, or perform the multitude of other activities that enable our civil society to function. In this modern era when business transactions between complete strangers are the norm rather than the exception, Notaries engender a trust that the critical signed documents we rely on are authentic. Such trust enables the sensitive documents of commerce and law to be exchanged between strangers with full confidence in their reliability. An informational brochure titled What is a Notary Public? helps Notaries explain their vitally important role to others. The brochure is printed in both English and Spanish, to help immigrants from Latin nations who often mistakenly believe that the ministerial Notaries of the United States hold the same attorney-like powers as do the Notarios of their native lands. Documents are notarized to deter fraud and to ensure they are properly executed. An impartial witness (the Notary) identifies signers to screen out imposters and to make sure they have entered into agreements knowingly and willingly. Generally, the Notary will ask to see a current identification document or card with a photograph, physical description and signature. A driver?s license, military ID or passport will usually be acceptable. For many documents, yes. Certain affidavits, deeds and powers of attorney may not be legally binding unless they are properly notarized. With other documents, no. Private entities and individuals may require notarization to strengthen the document and to protect it from fraud. Does notarization make a document “true” or “legal”? Only a few immigration forms must be notarized, such as the Affidavit of Support (1-134, I-864), but the U.S. Immigration and Naturalization Service (INS) regulations state that no one may prepare or file another person’s immigration papers unless he or she is an attorney or a U.S. Department of Justice-approved “accredited representative.” Notaries may provide clerical, secretarial or translating assistance with INS forms as long as they do not provide legal advice, and then may notarize these forms. Only if the Notary is uncertain of a signer’s identity, willingness, mental awareness, or has cause to suspect fraud. Notaries may not refuse service on the basis of race, religion, nationality, lifestyle, or because the person is not a client or customer. California commissioned Notary Public is on-site, ready to assist with all your California notary needs. $50 travel fee anywhere in the San Fernando Valley.